When people in the US who are into aircraft think of 1950s era trainers, they think of the T-33. This is a trainer development of the F-80 that lasted in military service 50 years. When people in Russia and Eastern Europe think of 1950s era trainers, they think of the MiG-15UTI. This was a two seat development of the MiG-15 fighter and lasted in military service for the same amount of time if not longer. It would not be out of line to say that if a nation flew a Russian made jet any time during the 1950s, 1960s, 1970s, and even into the 1980s and later, there is a good chance that their pilots learned about jets in the two seat MiG-15. The plane had all the attributes of the single seat version which included being easy to fly and equally easy to maintain, traits that put it in good stead with nations where skilled technical capabilities were often not available. This ease of flying and maintenance has made the two seat MiG a favorite with warbird operators as well and one can often find these flying the skies in the hands of those wealthy enough to be able to own such a piece of history. 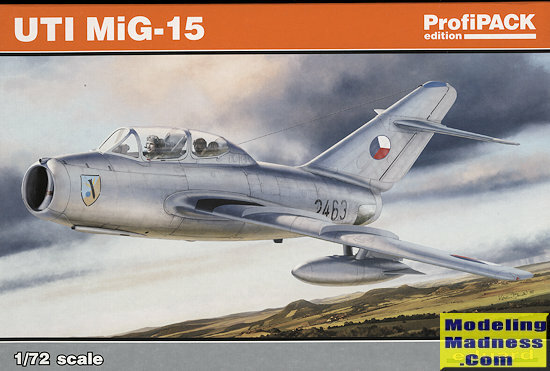 When Eduard released its 1/72 MiG-15bis kit, it was only a matter of time before we knew that the two seat plane was going to be done. Of course, this isn't the first time the UTI has been kitted in this scale as KP produced a very nice one for its time in the 1970s and Hobby Boss also did a nice one in its easy build series a few years back. However, this one has a higher level of detail than either of those and promises to produce a higher quality build. Since this is the Profipak version, it includes a set of canopy masks and a nicely done color photo etch fret. As is the norm with Eduard color etch, the grey they chose to use for the cockpit color is a bit off in regards to the paint that is recommended, but most modelers are not all that concerned. Just to give you an idea of what is on the fret, you have fore and aft instrument p anels, side consoles, seat harness, seat ejection handle, rudder pedals, sidewall detail, and a piece of detail for the inside of the windscreen. 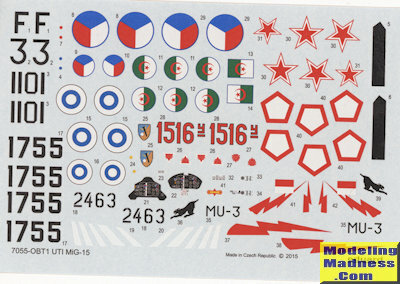 Of course, this means that the Weekend edition will not have this, but unlike some previous WE kits, you can simply use decals for the instrument panel and some side details. For many of us, the p.e. and masks are worth the extra $10 in price. The interior is nicely done as you can expect with nicely molded bang seats. The inside of the cockpit walls are curved as the intakes extend on either side to the engine. This is a feature that is missed by other kits. Once the cockpit is built up, it is trapped between the fuselage halves along with the exhaust pipe. There is room for weight, though the instructions do not specify how much is needed. The separate rudders are also trapped between the fuselage halves during construction. Two types of fuel tanks are provided and one needs to open holes in the lower wing for these. On the underside of the fuselage are two windows to help the instructor and student see the ground coming up during landing. This is another feature seen for the first time on this kit in this scale. The plane was used for gunnery practice as well and a single cannon is included. 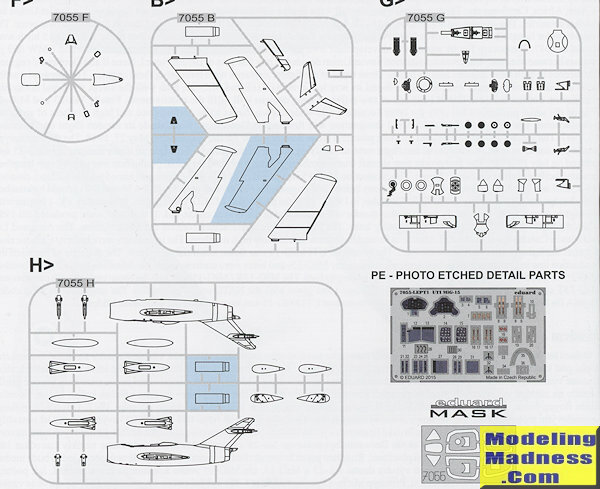 Apparently there are two different styles of main wheels for the plane and both are shown, though there is no indication of what scheme uses which style. You can pose the forward and aft canopy open if you wish and with all that p.e. in there, it wouldn't be a bad idea. Oddly, the kit has no provisions for open speedbrakes. These were seen open or at least cracked open a bit quite a bit. Two different styles of drop tanks are provided. There is no clear 'use this style' g uidance provided, though the larger ones were more prevalent later in their career. Instructions are well done and use Gunze paint references. Markings are for five aircraft, most of them in unpainted metal. I don't think that these planes were ever painted aluminum, but I'm willing to learn. Aircraft from Czechoslovakia, Indonesia, Soviet Union and Finland are in this scheme. There is an Algerian option where the upper surfaces are camouflaged in tan and green with RLB (Russian Light Blue) undersides. Decals are nicely done and there is a rather extensive stencil sheet (not shown) provided as well, which is a bit odd as there is no dedicated stencil placement diagram and that shown in the painting options is very stencil light. This is a very nice kit and a nice addition to the single seat version kitted earlier. Tom Cleaver built this one a while back and seems to have had little trouble with it.